Democrats and Republicans are widely divided in several of their views of the news media, a finding that is a sharp break from just a year ago. Overall, seven-in-ten Americans feel news media criticism keeps politicians in line, down just slightly from last year. But Democrats are far more likely than Republicans to hold this view. Nearly nine-in-ten Democrats (89%) feel media criticism keeps leaders from doing the wrong thing – a sense shared by only about four-in-ten Republicans (42%). In contrast, a year ago about three-quarters of both Democrats (74%) and Republicans (77%) backed the news media’s watchdog role. Most of the year-to-year shift occurred among Republicans, whose support for the watchdog role dropped 35 points. At the same time, Democrats are now even more likely to express support for it, rising from 74% in 2016 to 89% today. Among independents overall, views remained unchanged year to year (74% in 2016; 70% in 2017). However, independents who lean to the Democratic Party have become more likely to back the news media’s watchdog role (76% in 2016, 86% in 2017), while Republican-leaning independents have become less likely to do so (76% in 2016, 56% in 2017). When it comes to the perceived fairness of the news media, a strong majority of Americans continue to say news organizations tend to favor one side in presenting news on political and social issues: 72%, on par with the 74% in 2016. Only a little over a quarter, on the other hand, say they deal fairly with all sides. But the differences between Democrats and Republicans have grown wider over the last year. Now, roughly half of Democrats say the news media tend to favor one side (53%), down from nearly two-thirds (64%) a year ago. The views of liberal Democrats in particular have shifted: 53% say the news media favor one side, a 20-percentage-point decline from 2016 (73%). Moderate and conservative Democrats showed no measurable movement. Republicans, on the other hand, overwhelmingly think news organizations tend to favor one side (87%), in line with their 2016 view. Neither conservative Republicans nor moderate and liberal Republicans showed any movement. Pew Research Center’s long trend of phone surveys on this question (which are not exact comparisons with the current and 2016 web-based surveys due to the potential for small mode effects) reveals that Republicans have consistently been more likely than Democrats to say the news media favor one side in their political coverage. Still, with the exception of the end of the George W. Bush administration in 2007, the current gap is far wider than at any other point in the trend. The new survey also finds growing partisan differences in the level of trust Americans have in the information coming from national news organizations. As in 2016, few Americans express high levels of trust in news they get from professional news organizations or from their social connections. Just one-fifth of adults say they trust information they get from national news organizations “a lot.” Slightly more (25%) say this of news from local news organizations, while slightly fewer (15%) place a lot of trust in the information they get from friends and family. Lower than all three is social media. 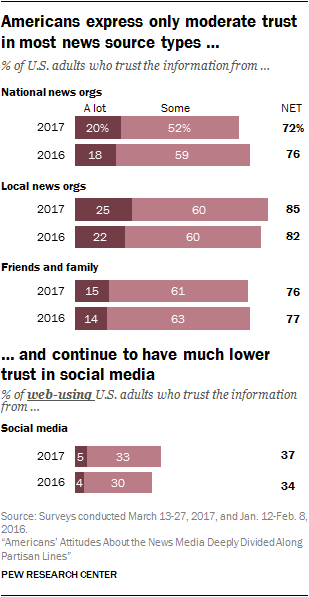 Even as we know Americans rely heavily on social media for their news – which is often at least partly filled by posts from friends and family – they continue to have very low trust in information from social networking sites. Just 5% of web-using U.S. adults have a lot of trust in the information they get there, nearly identical to the 4% who said so in 2016. Among these four sources, trust of national news organizations has the largest partisan divide, and it grew substantially since 2016. Roughly a third of Democrats (34%) express a lot of trust in news they get from national news organizations, compared with just 11% of Republicans, a 23-point gap. In 2016, Democrats also reported higher rates of trust in the national news media, but the difference was more modest (27% compared with 15% among Republicans). Similar to the level of trust in national news organizations, just 21% of Americans say the national news media do very well at keeping them informed. About half (54%) say they do fairly well, while the remainder say they do their job not too well (20%) or not well at all (4%). These figures overall are consistent with 2016 but there is now some distance between the parties. A third of Democrats now say the national media do very well at informing them, compared with only 18% of Republicans who say the same, a 15-percentage-point gap. (There was no significant difference between the parties in 2016.) And it is driven by older members of both parties. The percentage of Republicans ages 50 and older that give the national news media top marks declined by 10 points from 2016 to 2017; among Democrats of this age group, approval rose 11 percentage points. When it comes to local news media, the partisan split is much smaller and unchanged from 2016. Overall, 23% of adults say local news organizations do very well at keeping them informed. That sentiment is expressed by 29% of Democrats, only slightly higher than the 22% of Republicans who say so, with each party’s figures little changed since 2016 (21% overall, 25% of Democrats and 22% of Republicans).